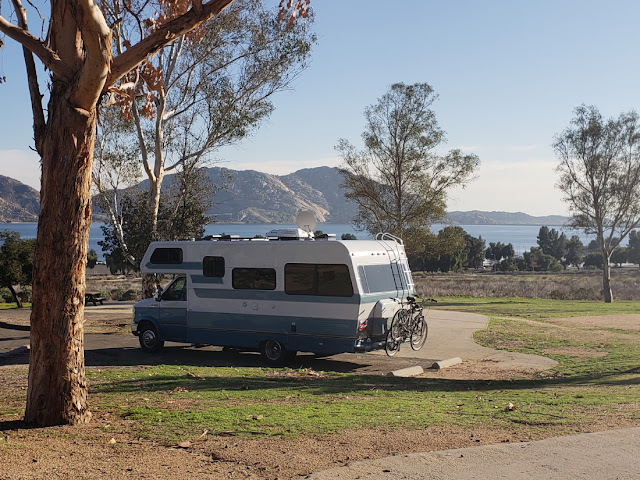 Leaving East Shore RV Park in San Dimas, California, we head south on Route 71,east on Route 60, and then south on Interstate 215, That brings us to Ramona Expressway and Lake Perris State Recreation Area. This leg of our travels includes some very heavy traffic. But we think some of our New England friends would be quite jealous when they see 5, and sometimes more, lanes in each direction. But even though this was not peak driving time, the 5 lanes slowed to a crawl in some places. 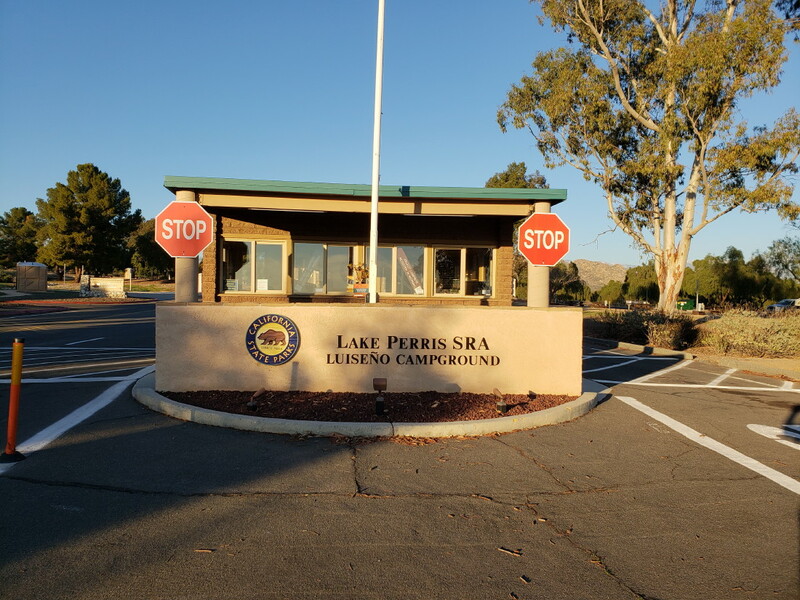 Lake Perris is a beautiful area. We are in the Dry Camp area-no electric, water, or sewer connections. But these sites are very well spaced and also have a much better view than the full hookup sites below. 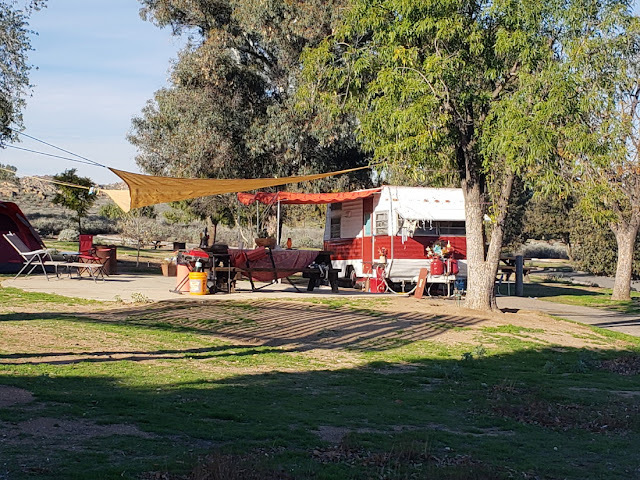 Jan and I are surprised that, with the heavily populated areas nearby like Riverside, there were very few people here. The office indicated that from October to April it is very quiet. There is a 10 mile bike trail through the park. And there is parking for about a thousand cars or more(near the swimming area). The host has quite a nice setup with an older 1960's? 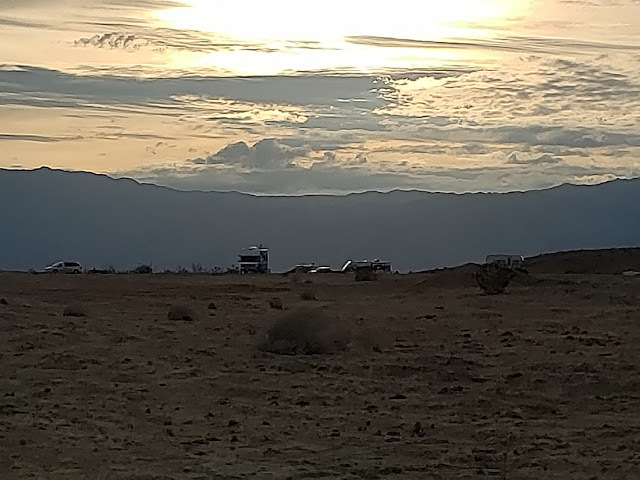 Shasta trailer. 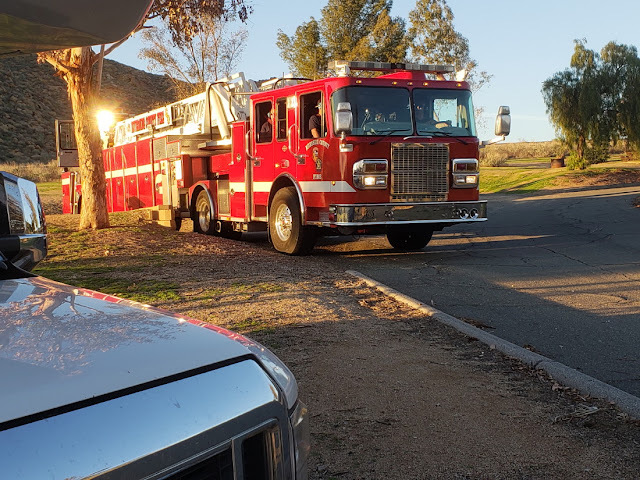 A little excitement one day when this enormous fire truck came through the park with about 8 firemen on board. Two of them were in the back to steer the rear end around the corners. As it turned out, they were practicing their handling techniques. Here they backed the huge ladder truck into one of our small sites. Anyone recognize this? This is the same model of tent trailer that we had when the Maggs kids were quite young. It is a 1972 Starcraft that was a wonderful summer family camping unit. We found ours , used, thanks to Richard A. It had belonged to the local Methodist minister. This camper belongs to a young couple , living in it full time. They were happy to hear our story, saying they loved the trailer. We had some shopping to do in Moreno Valley and then we headed south again on Interstate 215 to Route 79 in Temecula. By the time we were going through Aguanga it was getting late in the afternoon. 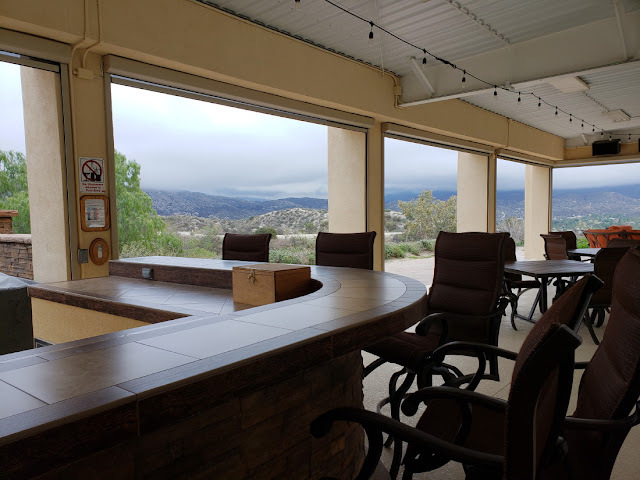 So we stopped at Jojoba Hills SKP Resort(one of our membership parks). 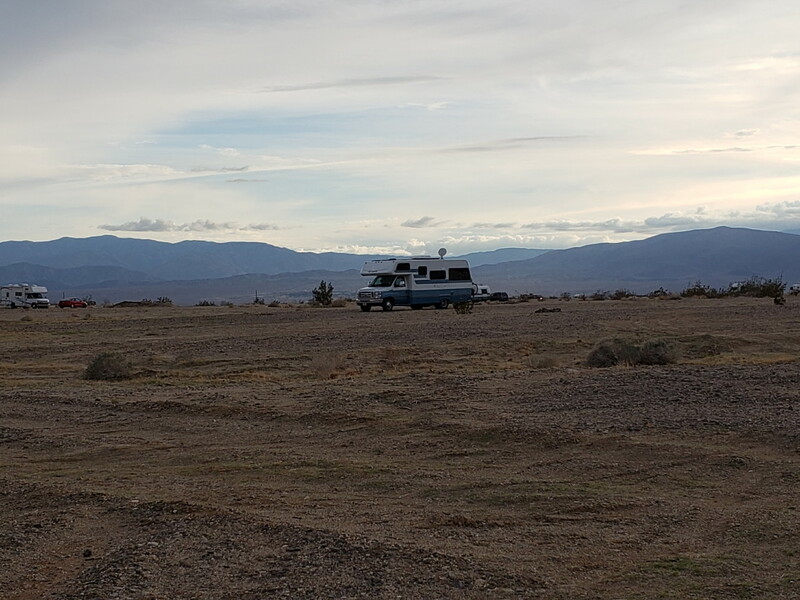 The office was closed ,but they let us in and we were happy to have a spot in the dry camping area. This is considered perhaps the best park in the Escapees system. The area above is part of the main building. Excellent for cookouts, lounging, the bar , a hot tub, and a swimming pool, are just a few of the many things available in this area. The view is not too bad either!! The members here are very proud of their lots. 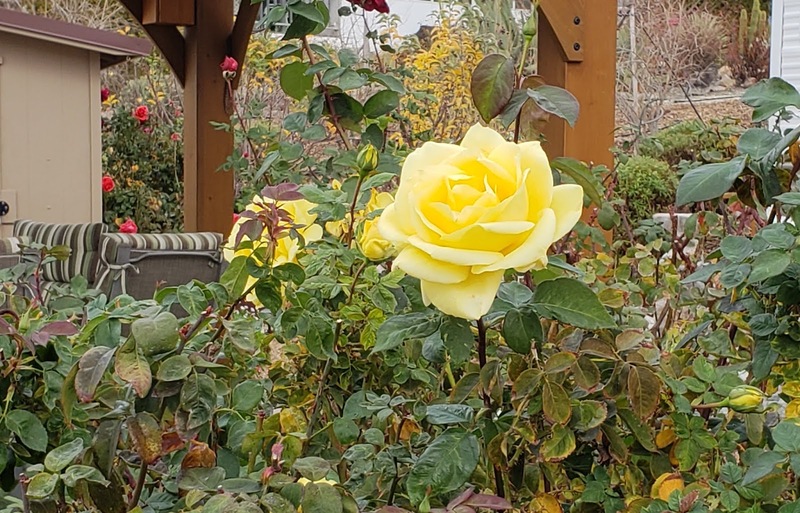 This was a spectacular yellow rose. We missed John and Linda and a few other Lazy Dazers that we didn't even know were there. Just a little south of Jojoba Hills and off Route 79 on Route 371, is the Temecula Olive Oil Company at Olive View Ranch. The hosts were great with good information for Jan on the olive oils and vinegars. 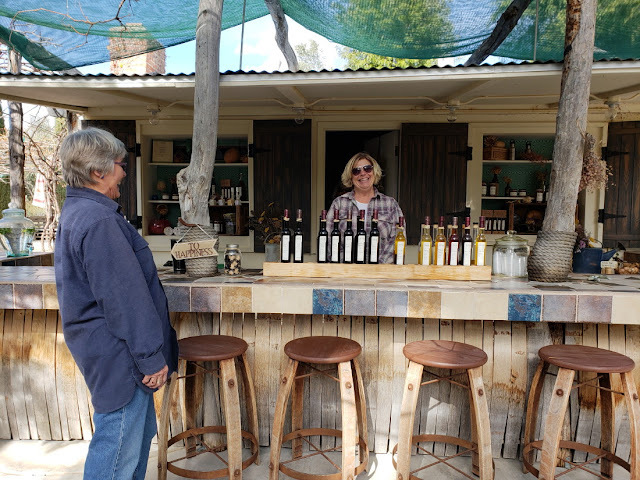 Jan picked a Hickory Smoked olive oil, a Winter Harvest Valley Blend olive oil, and a Fresh Apple Balsamico Bianco vinegar and a jar of Tapenade with olives, olive oil, anchovy, garlic, capers, and spices. 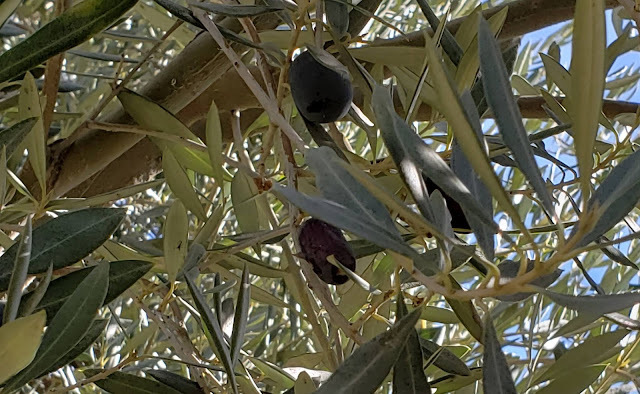 For those of us from the North and East, the links above are quite interesting on their website with videos of the fields, olive harvesting, and olive oil pressing. This shop , in Aguanga, is not listed on their website. 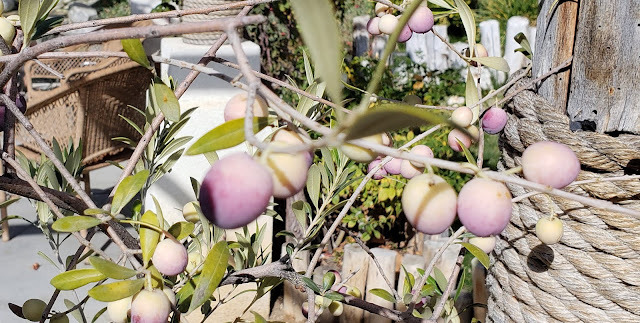 On the porch was this potted plant of purple olives--just ripening. The other trees on the property had been harvested. This tree still had a few left overs that were beginning to dry up. Back to Route 79 east. Not a lot of traffic and then even less on S2, and then Route S22, which gives us this view above. We now see why all that traffic stays back around Temecula. The elevation here , around Ranchita, is over 4,000 feet. 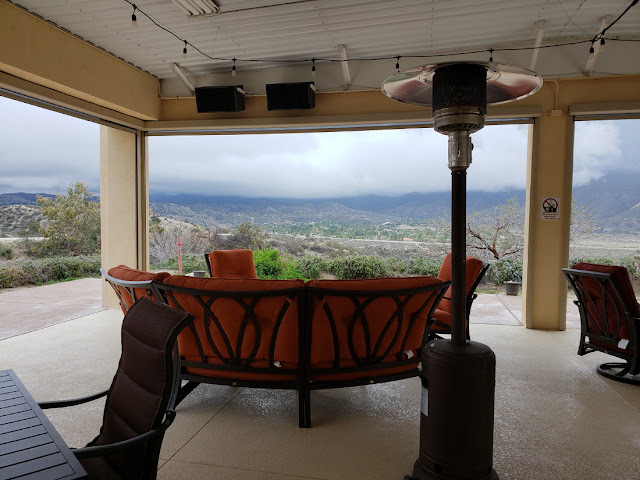 Ranchita gets around 14 inches of rain and 6 inches of snow per year. As a note for some of you hikers, you can do hiking in and around Hellhole Canyon, to the left a bit, and hike up and down the 4,000 feet. By the way, do you see the car on the road to the left? 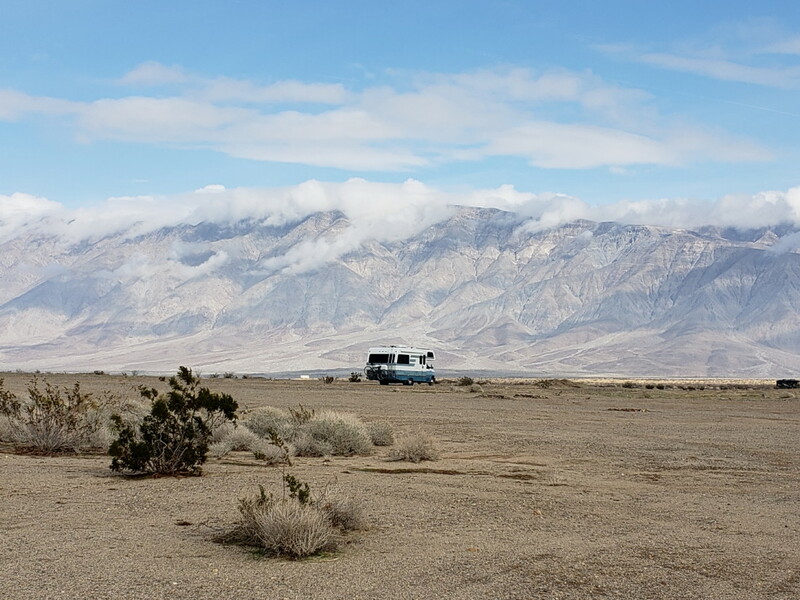 The following link takes you to a hiking website for Hellhole Canyon. Note that some of the peaks nearby are well over 5,000 feet. Let us tell you. This is exciting driving in a Class C motorhome. Gee-----Thanks for the BIG??? warning sign. Many of these corners are straight down off the edge. Not only a corner , but you can click on the picture and see some of those precarious looking boulders up ahead on the right. Every now and then a turnout. Quite different from the Shenandoah Skyline Drive( no green , trees, etc) but a 4,000 foot view for a hundred miles or so. 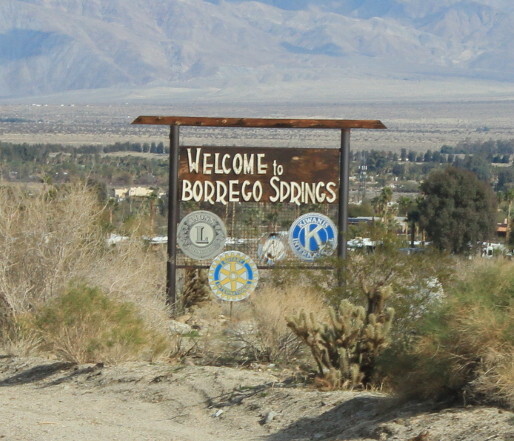 Borrego Springs is below to the left. Ah, now we can see it. Jan and I find a nice spot for Lady Blue on BLM(Bureau of Land Management) land. Free and just outside Borrego Springs off Pegleg Road. 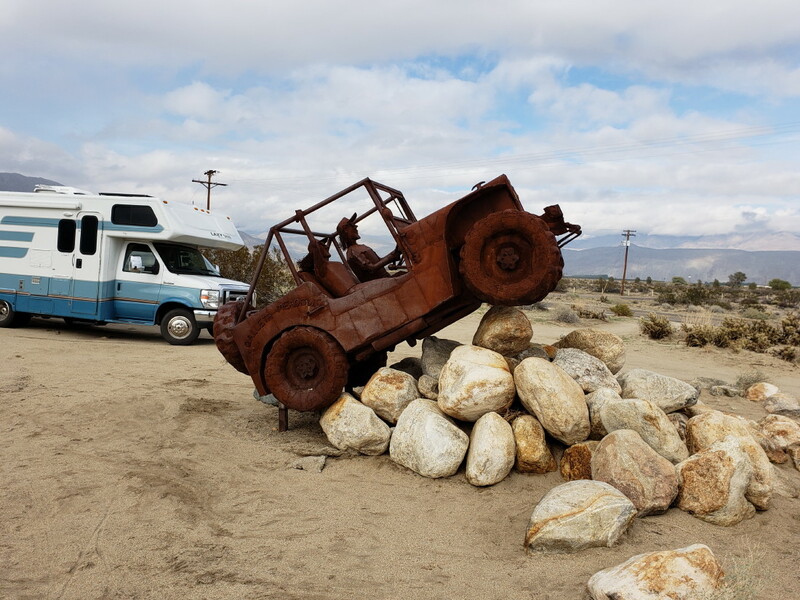 From Borrego Springs, we follow Palm Canyon Drive (S22) which becomes Pegleg Road, and then left on Rockhouse Trail. From here, some of the views are up 4,000 feet or more. For instance, on our walk near Lady Blue. You can see a good sized Class A motorhome ahead, and the mountains reach up past the clouds. 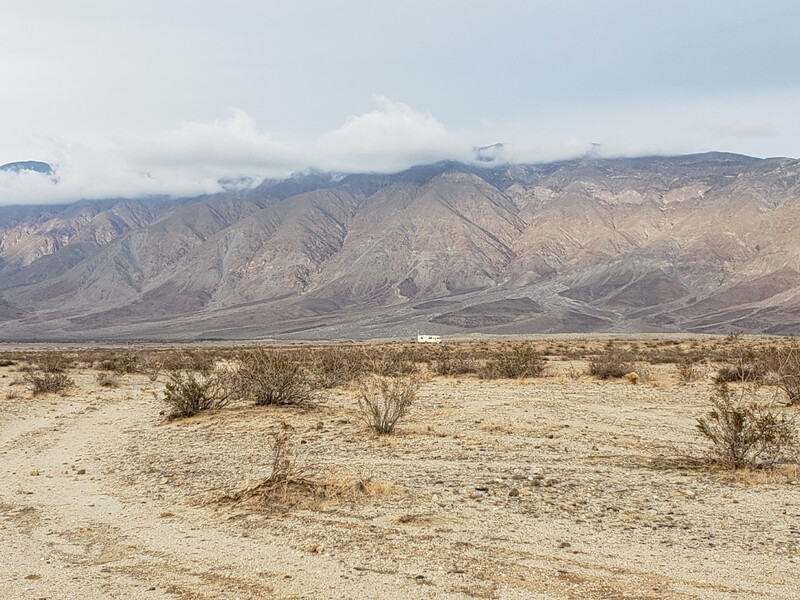 Mostly creosote bushes on the desert floor. On this day we can enjoy looking up towards these mountains and see rain, clouds, blue sky, and sun--all at the same time. I actually had to hustle to put the telephoto lens on the Canon camera. Trying to capture some of the wonderful and changing light paintings created by nature. The telephoto lens helped when the sun hit the mountains and clouds in the background. Lady Blue loves this stuff. 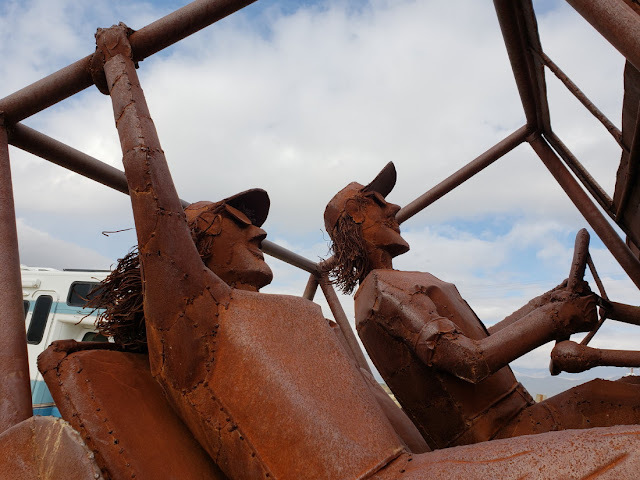 These are some of the Sky Art Sculptures. 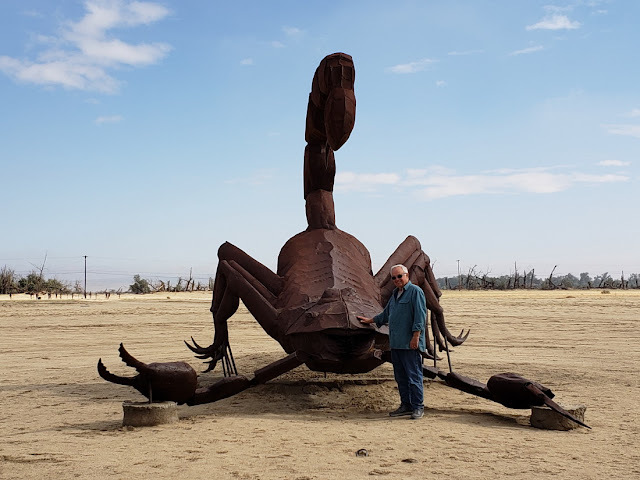 The 130 full sized metal sculptures are by Ricardo Breceda and are on land owned by the late Dennis Avery owner of Galleta Estates. 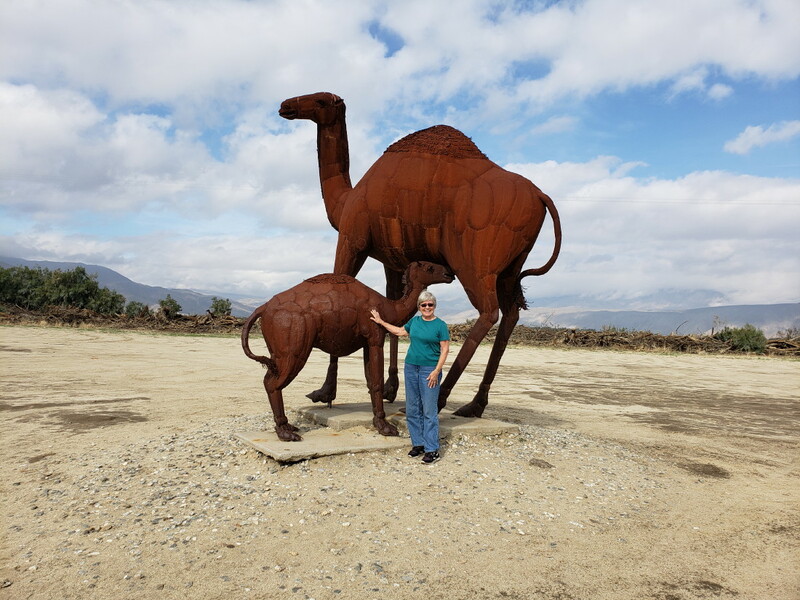 Jan is dwarfed by the camel sculptures. These sculptures are inspired by animals from millions of years ago. The website above has many ads. 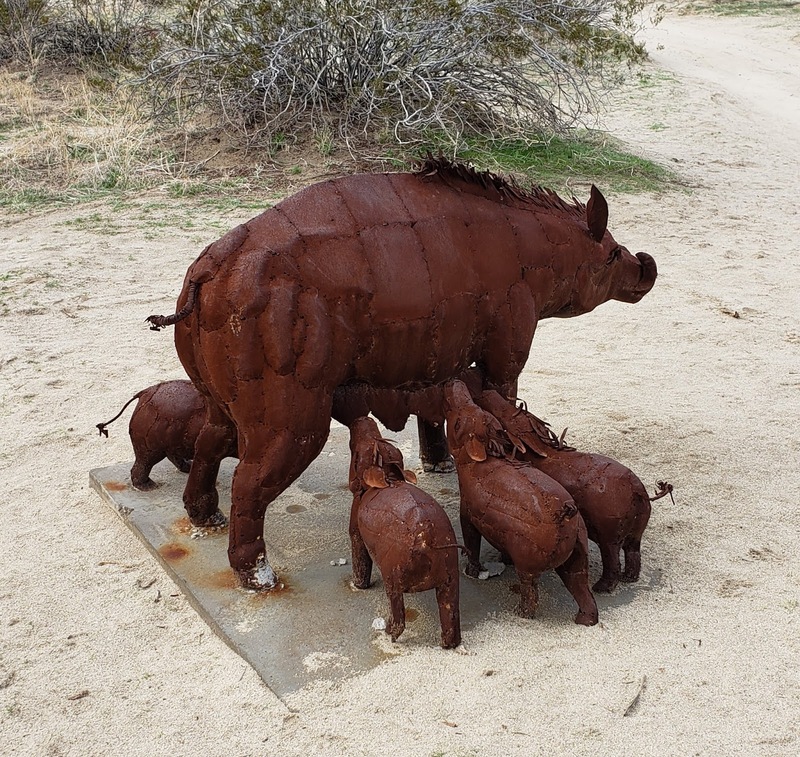 This boar or pig is one we had not seen before. 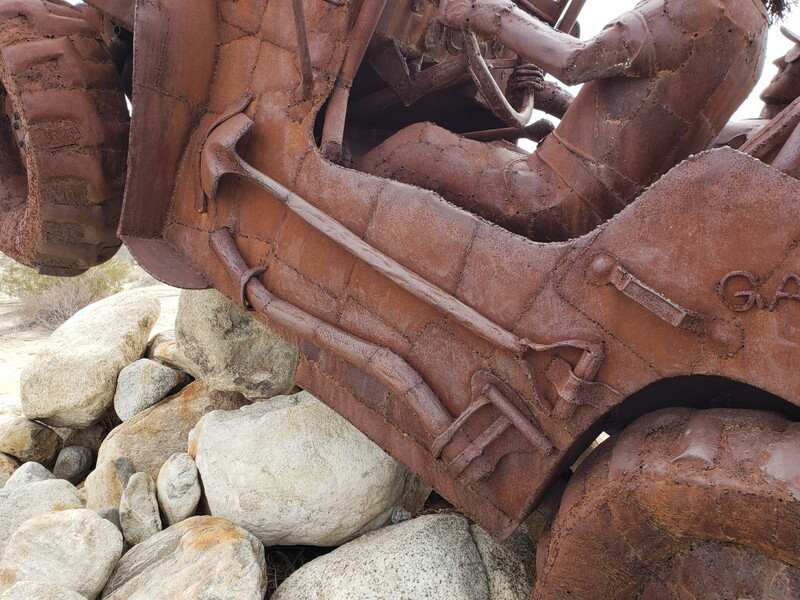 One of our favorites that is not prehistoric, is the Jeep sculpture. Love the detail for the faces, clothing, and, yes, metal hair. How about the axe and shovel. 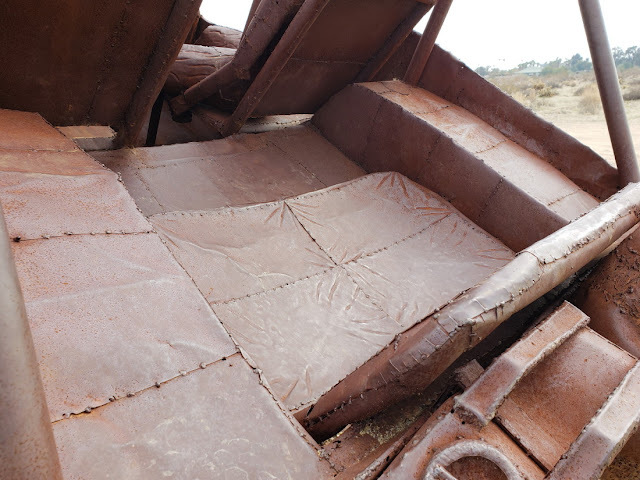 There is also some metal "dirt" in the tires. One we couldn't figure out is how the artist put leather wrinkles into the seat fabric. The video above is of the serpent sculpture.